and help handling companies, ground services providers and aviation? After years of deregulation and growth in the aviation industry, boosted by the continued success of the "low-cost" airlines, it has become increasingly challenging for ground services providers to cut their costs and provide an excellent customer experience. The number of flights in airports all over the world has increased and it is crucial not to waste precious time for turning around planes, but it is essential that safety must always remain the highest priority. Synx has been built to bring together all of your data and not only give you insights on our operations but also the tools to implement changes and improvements. Learn how you can benefit from Synx today. Airlines and handling companies operate in different airports located around the world but need a global view of their operations. Airlines and handling companies need to view location of their equipment on the ground in real time for operational reasons. In order to better organise their work, they might need to create virtual areas, inside the airport complex, where their vehicles go or operate. For airlines and handling companies it is vital to work with airport systems and software. Cutting costs is essential in order to provide the best price for customers, so these companies aim at saving money on fuel and maintenance and prevent misuse. Guaranteeing the highest level of safety for those who work and the other users, as well as providing compliance is not only desirable, but mandatory. The organisation and control of the operations and the vehicles has to be done with easy-to-use tools. With SynX, you can get the full picture of your fleet and operations on your computer, tablet, phone, on any device, with a system that is scalable across airports. SynX and its frequent updates on vehicles location give you complete control of the fleet and help you streamline your operations. With SynX and the geofence option, you can create customised maps for airports in each airport location, classifying them according to your needs. SynX can be integrated with airport systems and connected to your IT infrastructure. With SynX you can easily manage fuel consumption, set up targets for decreasing it and keep an eye on global fleet costs. SynX will helps drivers to switch to safe and fuel-efficient driving. Compliance is guaranteed through walkaround checks and activity recording. SynX is an intuitive solution that will save you time and money optimising the way you manage your fleet. Manage fuel, safety, maintenance, vehicle and walkaround checks through a single tool with all the benefits of GPS tracking. Have all your assets on the ground under control and guarantee a safe environment by monitoring driving behaviour. Promote ecodriving by eliminating idling and see how your fuel consumption decreases. The system is completely customisable to your needs: we build technology in cooperation with our customers to provide the best solution for them. You can see the current location and status of your equipment on the ground in real time. Through our interface you can focus on groups of vehicles or even individual vehicles depending on your needs. 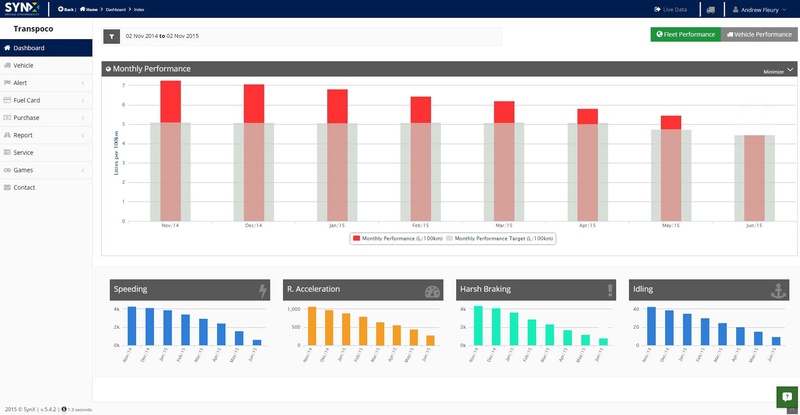 Real-time monitoring of all your vehicles on the ground will allow you to optimise ground operations while guaranteeing safety and cutting on your costs. Create a database of locations and routes and check the position of your vehicles and assets. Create virtual areas/perimeters with Geofence and trigger alerts to detect if unauthorised vehicles enter a particular zone. We can connect our portal to your IT infrastucture. For aviation and ground services this could mean integration with airport systems, resource management, flight information systems, billing systems, human resource managment systems. We propose a solution that is easily scalable and customisable across the airports you work in, plus any new airports you might add to your business.